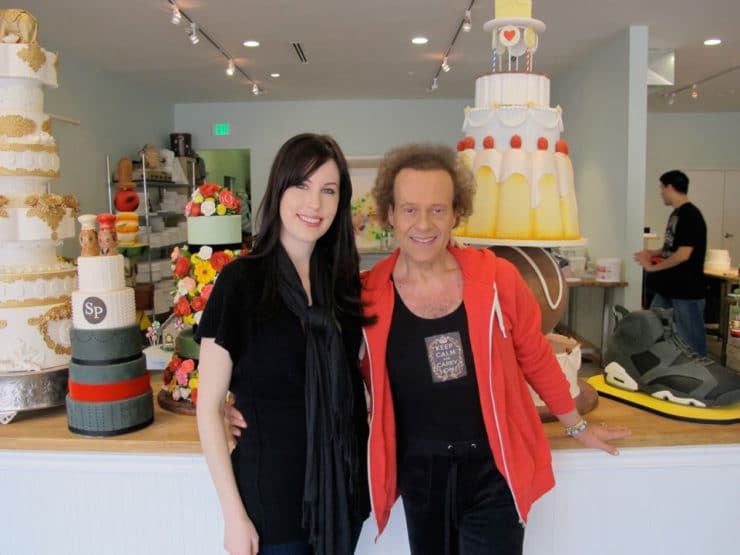 Living in Los Angeles has all kinds of perks… great weather, beautiful beaches, and the possibility that when you’re out and about, you might just run into Richard Simmons. I’ve been a fan of Richard’s for years. When I was in elementary school, my mom would work out to his VHS cassettes. Remember “Sweatin’ to the Oldies”? Good times! Richard has a kind and generous spirit. He’s made it his life’s mission to inspire people who are struggling with their weight. Richard spends a large part of his day coaching and mentoring people online at his official website, through his Slimmons Studio classes, and through his various fitness-related projects. On top of all that, he just released a single for the U.S. troops… yes, he sings! How fabulous is that? A few days ago, I stopped by Duff’s Cakemix to take some pictures for another interview with Duff Goldman. While there I ran into Richard, who was ordering a cake for his assistant’s daughter’s birthday. I met Richard last month when I attended one of his exercise classes at Slimmons Studio in Beverly Hills. During that class he gave me a new nickname– “Snow White.” Richard was kind enough to sit down with me at Duff’s Cakemix for a quick interview. He also shared a super creative and yummy recipe for a Beet Bowl Salad, which I’ve posted below. So you’re into healthy cooking. Obviously. Yeah, but you know what? I believe in treats. Every Saturday I have a dessert. It could be a piece of coconut cream pie from Du-Par’s. It could be a chocolate éclair from Beverlywood Bakery that’s been there for 80 years. So every Saturday it’s a dessert. I don’t eat the whole thing, but I enjoy it. You know, I’m 138 pounds and I burn off a lot of calories. I burn about 4,000 a day. My mother and father, they were both great cooks. Being from New Orleans, the food is so great there. So my father knew the chef at Antoine’s. My mother was a waitress at Brennan’s. They would swap recipes for Eggs Benedict and Bananas Foster and of course the famous fish that was cooked in parchment. It was a lot of fried food. Everything was fried there. Wow, you grew up with some great, colorful cooking influences. Yeah, but I was 200 pounds in the 8th grade so how great were the influences? Good point. So how is the food you cook now different than what you grew up with? Well, I don’t fry anything. I use a lot of fruits and vegetables. A lot of people are afraid to combine them. But I like combining beets and clementines, or bell peppers and kiwis and strawberries. Do you entertain a lot at home? No. I have a lot of work to do. I’m up at 3:30 in the morning answering emails, and I go to bed at around 11. Say my prayers, count my blessings and ask God for another day. Richard always makes me smile. He sparkles with positive energy. 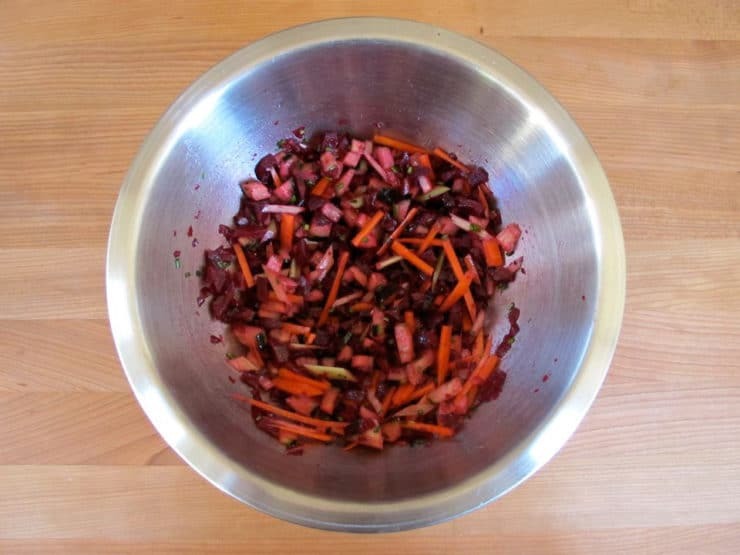 Here is his recipe for Beet Bowl Salad. It’s just as yummy as I imagined it would be. I love it when something so simple and natural tastes so good. Enjoy in good health! Follow Richard on Facebook, Twitter and YouTube. An interview with Richard Simmons and his healthy, creative recipe for Beet Bowl Salad. Easy vegan modification. 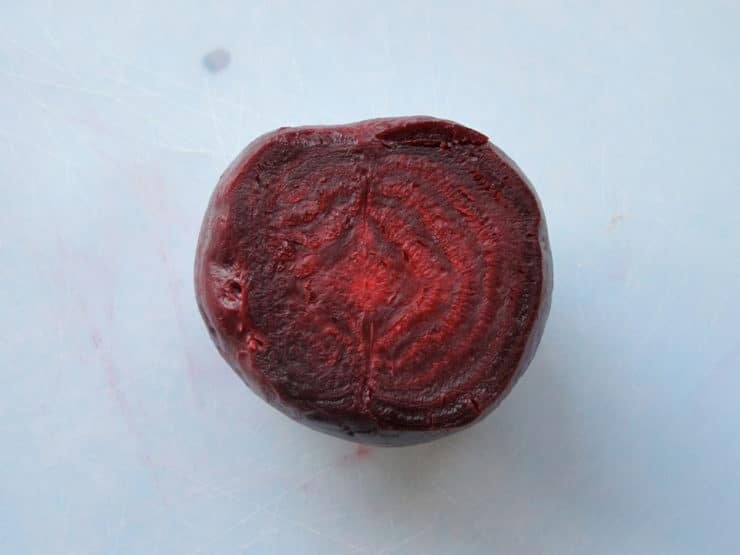 Remove the greens from the beets, keeping a small portion of the stem and the whole tail intact—this will help keep the natural juices inside the beets. 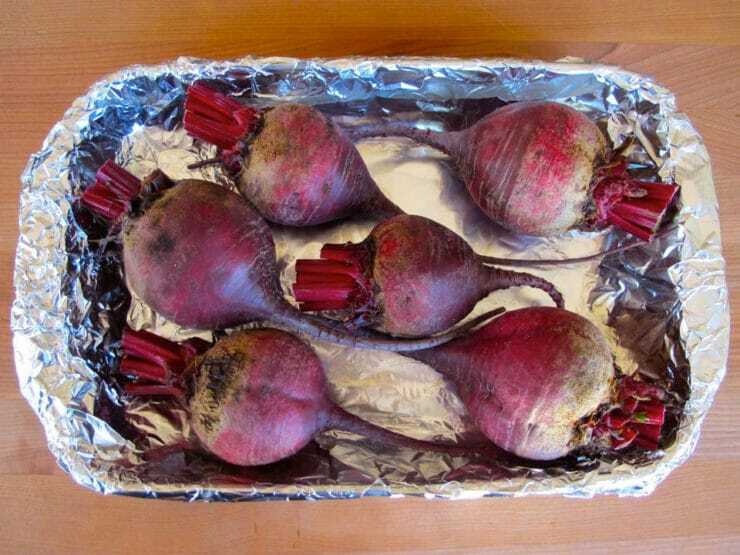 Cook the beets until tender, either by steaming (Richard’s recommendation) or by roasting. 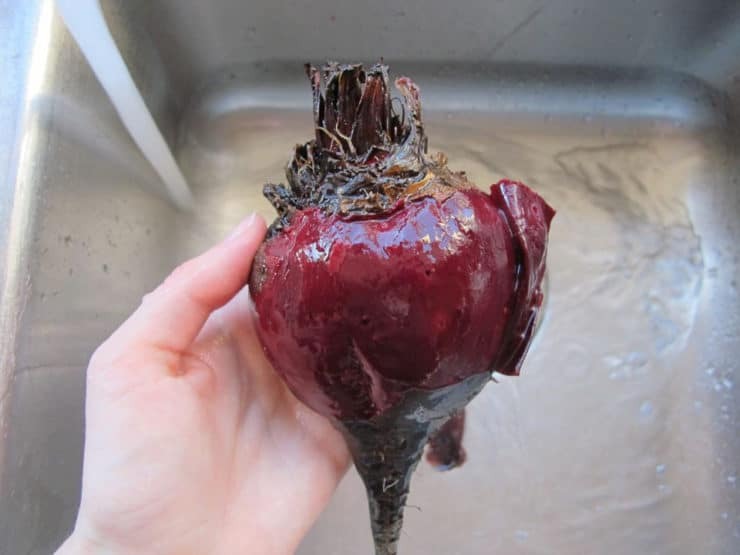 Do not boil the beets, they will lose flavor and nutrients. Steaming or roasting is preferable. 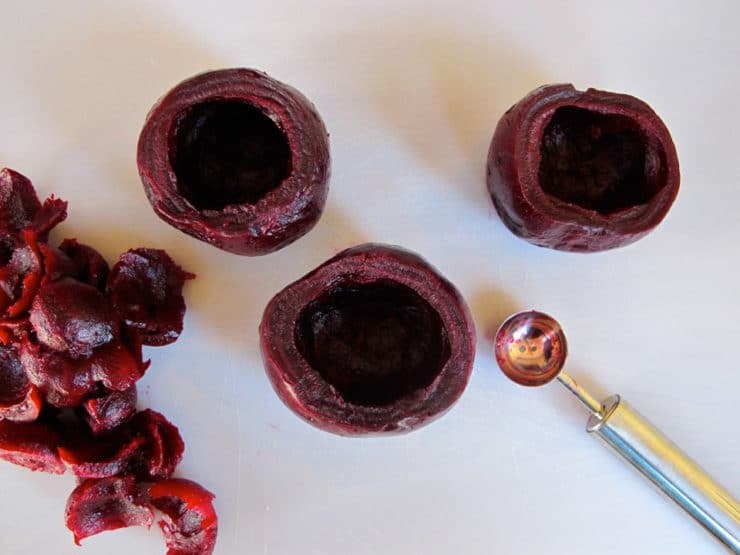 To learn how to roast beets, click here. 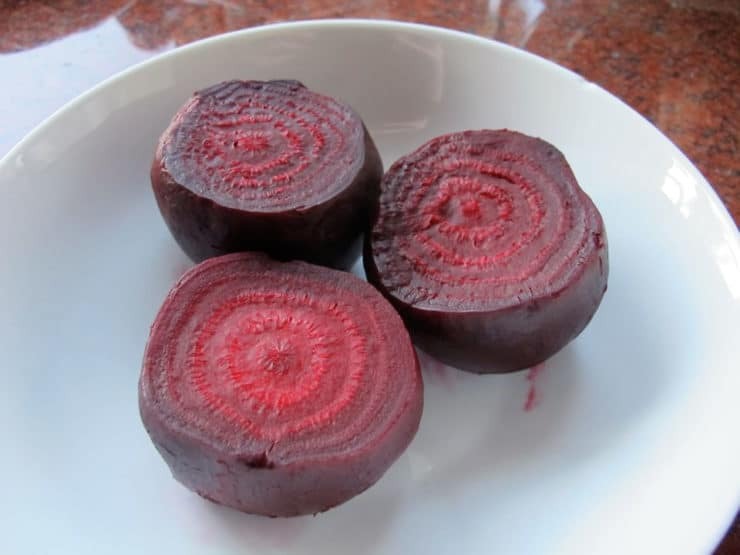 If roasting, be sure to turn the beets often so they don't become flat on one side. 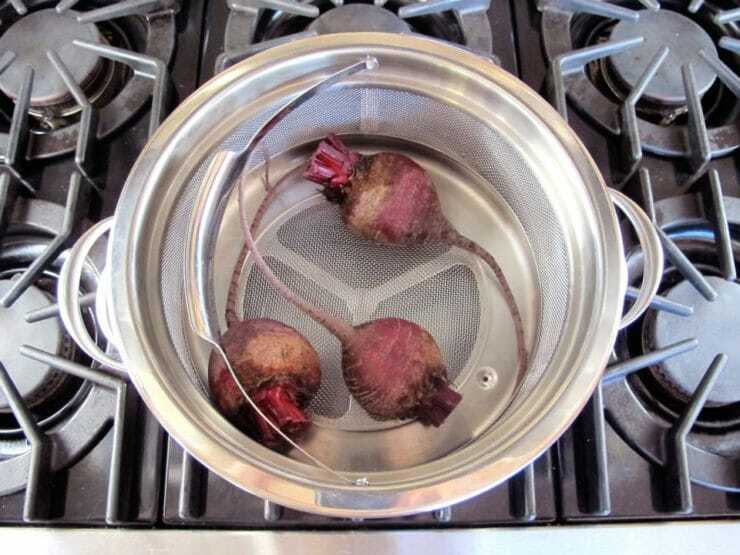 To steam the beets, place them in a steaming basket over boiling water. Let them steam for 1-2 hours till tender. Cooking times will vary based on the size of the beets. Test tenderness with a wooden skewer—if it glides quickly to the center of the beet, it’s done. Once the beets are cooked, peel them. Richard recommends wearing disposable gloves to keep your fingers from staining. I usually peel them under cool running water. Be sure to peel the beets when they’re warm, it’s easier that way. When the beets are peeled, slice off the tops (stem ends) and bottoms (tails) to make them flat on each side. Stand the beets up on the flat bottom end and make sure they stand stable/flat and aren’t tilted. If they are tilted, adjust by slicing a little more off the bottom until it stands straight. Once the beets are peeled and trimmed, let them cool to room temperature, then place them into the refrigerator covered with plastic wrap to chill completely. 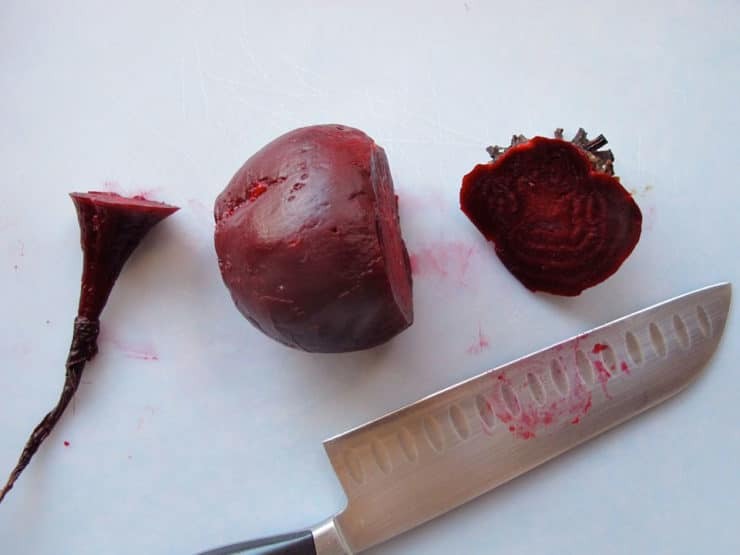 When the beets are thoroughly chilled, use a melon baller to scoop out the center portions of the beets to form a “beet bowl.” Leave a wall intact around the sides of the beets and a sturdy base at the bottom, so it will stand up to stuffing. 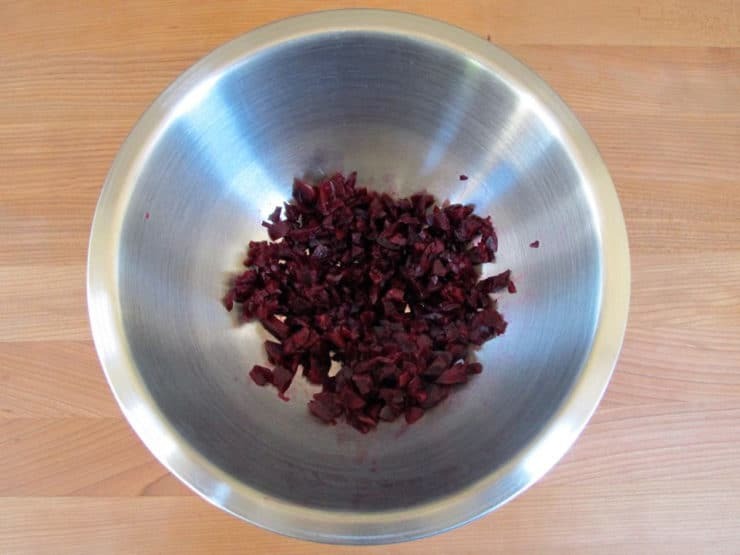 Dice the scooped out beet pulp into small pieces. Place in a mixing bowl. 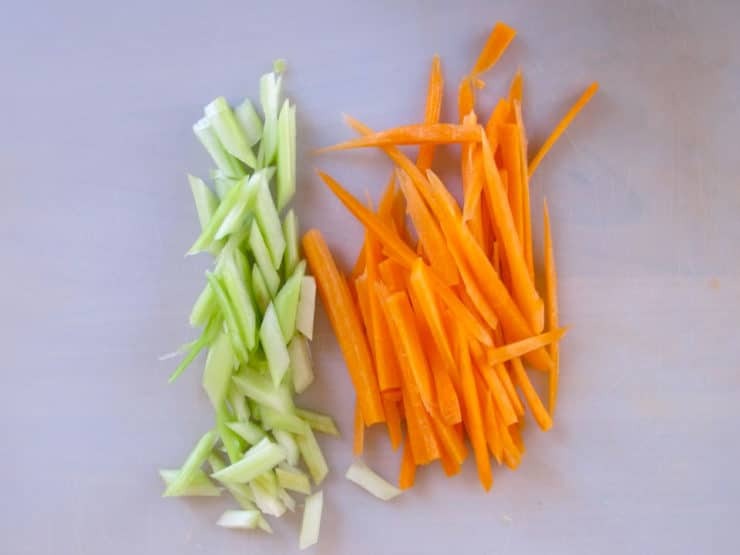 Julienne or grate the carrots, then julienne the celery into small, thin pieces. 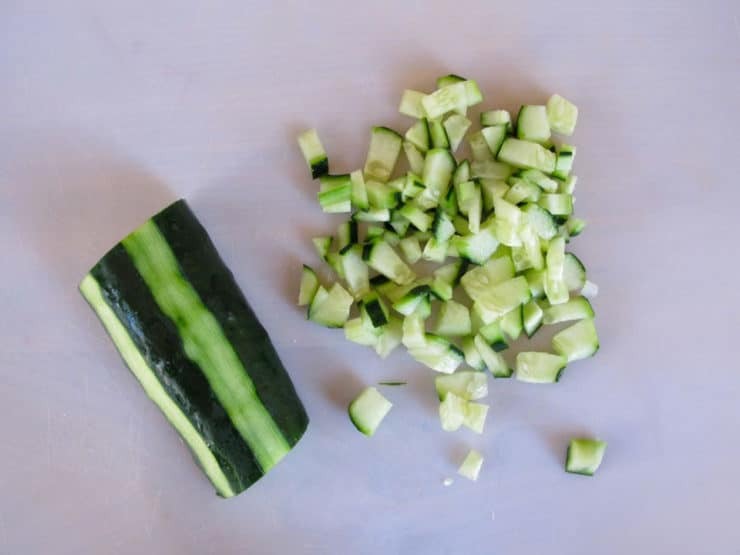 Peel the cucumber halfway, leaving stripes of skin down the sides of the vegetable. Dice the cucumber into small pieces. 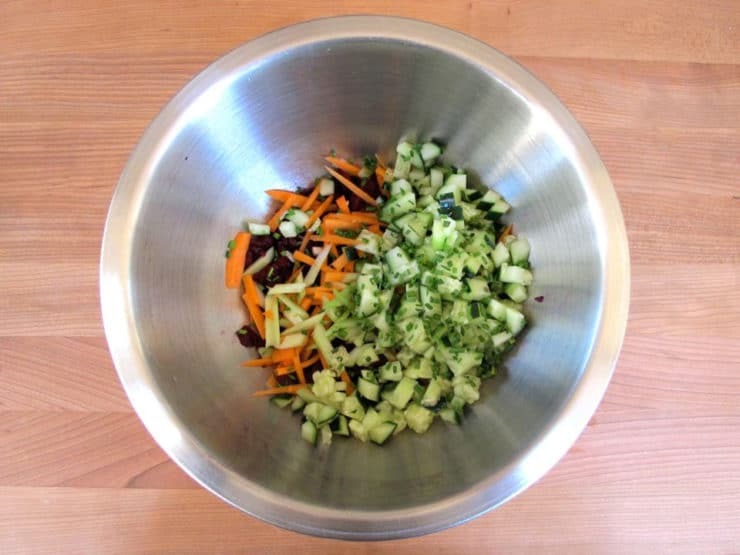 Add the prepared carrots, celery and cucumber to the mixing bowl along with the chopped chives, vinegar and olive oil. Gently toss the salad mixture till blended. Season with freshly ground black pepper to taste. Use a small spoon to fill each beet with the dressed, seasoned salad mixture. You will have a little bit of the salad leftover. Eat it. It’s yummy. 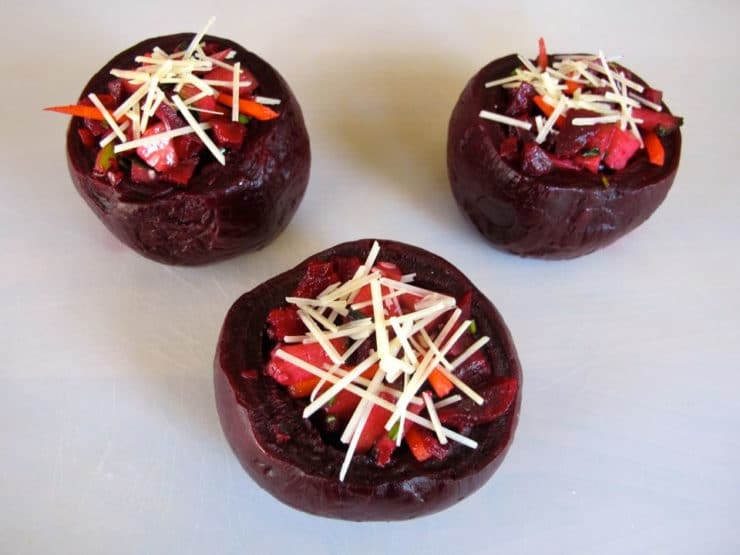 Once the beets are stuffed, top each one with a bit of grated parmesan cheese. Serve. 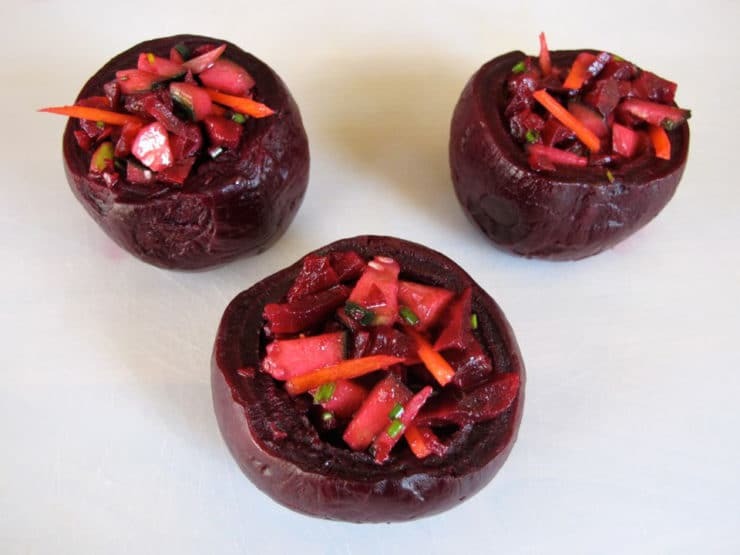 You can stuff the beets up to 24 hours ahead and chill in the fridge till ready to serve. Add the parmesan cheese just before serving. Passover modification: Substitute balsamic vinegar for champagne vinegar. You can make the salad dairy free (vegan/pareve) by omitting the parmesan cheese and lightly salting the filling to taste. 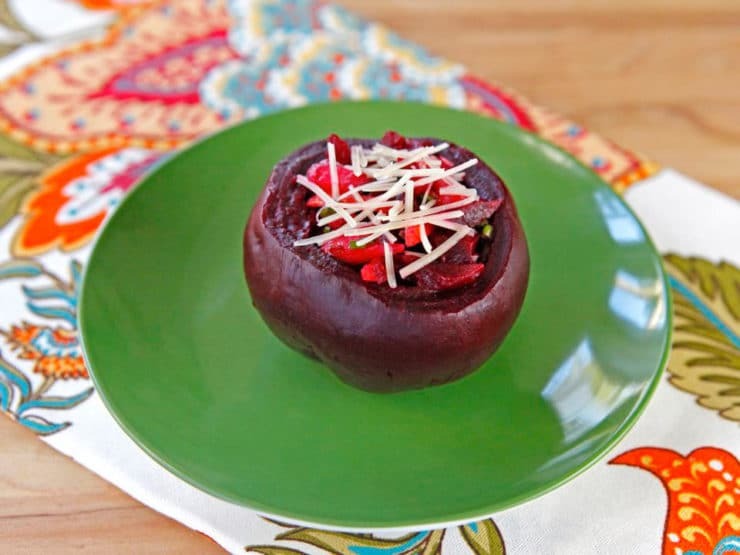 Sprinkle the top of each beet with chopped chives instead of parmesan.